Cardtronics Inc., has announced it will acquire Access to Money. The combined company will operate approximately 52,250 ATMs, encompassing both company-owned and merchant-owned machines. 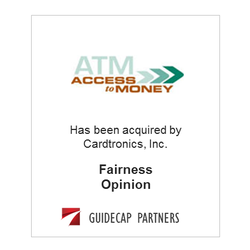 ​GuideCap issued a fairness opinion to the shareholders of Access to Money, Inc.